Misericordina. Medicine for the heart. 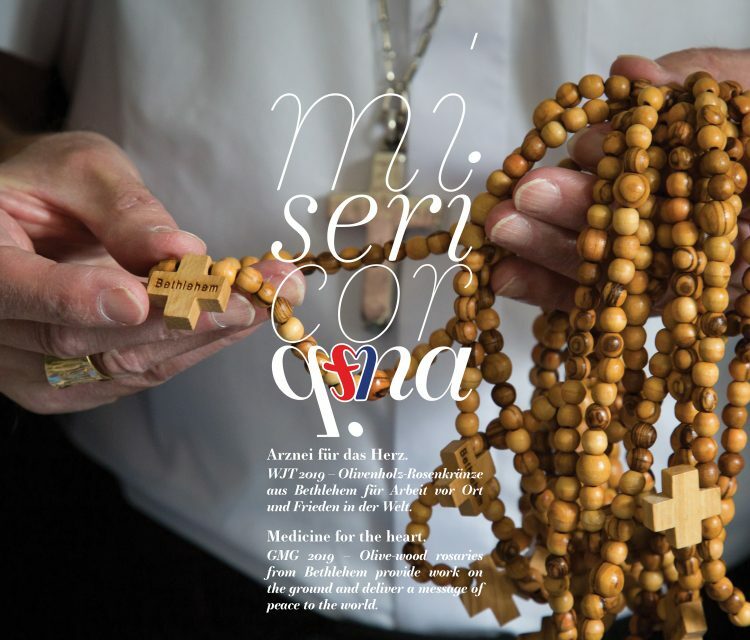 GMG 2019 Olive-wood rosaries from Bethlehem provide work on the ground and deliver a message of peace to the world..
A missionary gift from the Pope, documented by Andrea Krogmann on behalf of the Austrian Pilgrim Hospice in Jerusalem. Following a request by Pope Francis, 1.5 million olive-wood rosaries were commissioned in the Holy Land for the upcoming World Youth Day in Panama. This provided work for many citizens of Bethlehem and paves a path to peace throughout the world. Gnarled, wild, austere: for thousands of years people in the Holy Land have been cultivating olive trees. Even in the Bible, the tree with its evergreen leaves and valuable fruit has a special role to play. The dove brings Noah an olive branch as the tide recedes. Kings, prophets and the sick are anointed with the oil of its fruit. The light of the Temple is ignited with its oil, and to this day believers associate the olive branch with the entry of Jesus into Jerusalem. Thus, the tree has become the dominant symbol of much that is so urgently needed in the Holy Land today: peace, hope and prosperity. The olive tree and Christmas are both potent symbols of Bethlehem. For more than a thousand years artisans have turned the honey-coloured wood into works of art. Traditionally these works are made by hand and in small family concerns: cribs, carved figures, jewellery and pendants, crosses and rosaries. From this humble starting point they carry their message of hope and peace all over the world. Just as the rosaries for the 23rd World Youth Day 2019 in Panama. Like the artisans in Bethlehem, the youthful participants 12,000 kilometres away in Panama City will run the beads from the Holy Land through their fingers. In the beginning the Pope’s heartfelt concern was that the youth should pray for the peace of the world and that this prayer should begin with the Holy Land. That humble intention turned into a major charitable project. In collaboration with Caritas Jerusalem and the Association Saint-Jean-Marie Vianney Lausanne, 1.5 million rosaries were created in a time span of 18 months. 30 tons of freight, 81 million beads, 1.5 million crosses, cellophane bags and small images of the Pope, 750 kilometres of elastic decorative drawstring, brand name „Stretch Magic 1mm“. And a secured income for around one and a half years for about 800 people from Bethlehem, not including indirect income for timber merchants and a host of suppliers. The costs of production and transportation amount to one dollar per item, feasible from a Western point of view, and of invaluable help to the families involved in Bethlehem. A million rosaries from Bethlehem have been shipped in two containers to Panama: two for each participant, one for them and the other for someone in their home country. The remaining half million will be distributed among young people who cannot attend World Youth Day. This missionary gifting carries the name of Bethlehem and brings the desire of its citizens for peace a step further into the world. The exhibition „Misericordina. Medicine for the Heart“ was opened on 15 Dec. 2018 in presence of the photographer Andrea Krogmann and Rector Markus St. Bugnyár. Until the end of May 2019 the exhibition can be visited on the 2nd floor of the Austrian Pilgrim Hospice – take the opportunity and get to know a piece of the everyday reality in the Holy Land.